Kordiris' innermost over-water private bungalow, before construction of second two. Located on the islet of Kordiris, which is separated from the Gam Island mainland by the wildlife rich Dore Dor mangrove waterway, Kordiris Homestay lies in the shelter of the point at the western end of a perfect white sand bay. The winding mangrove filled waterways and dense jungles of Dore Dor are a birdwatchers paradise, alive with hornbills, sea eagles, eclectus parrots, kingfishers, herons… the list goes on. The sandy beach at Kordiris offers great snorkelling over seagrass and reef. Dugongs can sometimes be seen in the bay at front of the homestay and walking sharks are regular visitors. Whales can be observed further offshore from the homestay as they move through the strait in April and May. The jungle behind Kordiris is home to Birds of Paradise, couscous, squirrel-like tree rats, black king cockatoos and bush fowl that build huge nest mounds in the forest. Kordiris Homestay has an on-site dive center and offers guided dives at all the popular Dampier Strait sites. Equipment is available for 8 divers, and Kordiris’ dive boat carries emergency oxygen and a first aid kit. Kordiris has 10 sets of snorkeling gear available for hire at IDR 100,000 per set per day and can arrange snorkeling trips to anywhere you might want to go. A Red Bird of Paradise display tree is located a 15 minute walk from Kordiris. Guided visits cost IDR 100,000 per person. What’s the point of having an official booking for over a month if Kordis homestay will cancel it 2 days before arriving? beware of this home stay, i had to cancel all my diving as well. Kordiris contacted you and cancelled your booking Ricky? Yes, they send me and email 2 days before my arrival, saying that they are full and cant pick me up as well. I planned this stay/dives for months and everything went down the drain. I just booked with Beser. The Homestay Association is working toward imposing sanctions (that include removal from the website) for members who do not honour bookings they have confirmed. Hopefully that will fix this problem. I enjoyed my stay at the Kordiris homestay, the bungalows are all in row over the water, social and peaceful at the same time. my bungalow had a good mattress and mosquito net and I saw a walking shark and a Moray eel from my balcony. The snorkeling is good with interesting seascape, I saw a puffer fish almost 2 feet long twice. Sharks come up to the deck where we eat. watch out for the current, the food is good and Anton is usually there as a translator. Local e região paradisíacos, básico, mas limpo. Pessoas muito simpáticas, alimentação sofrível. Espetacular para mergulho ou simplesmente snorkeling, um verdadeiro aquário com peixes de cores incríveis. Região a visitar obrigatóriamente para quem goste da natureza. We stayed a week and really enjoyed it. Food was fine, basic, good and tasty, but not special. Enough quantity and variety. Have to say: clean and nice bathrooms. House reef is quite ok, not the best. But is easy to walk a bit further during low tide and coming back snorkeling through the reef; or swim to the small islands in front. The family is nice and kind, easy going. Lusi, Kornelis and Anton make you feel at home. Did a total of 6 dives with them and loved it, only comment I would make is no PADI standards were adhered to… so make sure you’re a confident diver and do your own buddy checks ! Hi! I’m trying to find the prices for the diving. How much is a dive (we don’t have our own equipement)? Is there a discount if we do 12 dives? A beautiful experience that we will always remember! We stayed at Kordiris Homestay for 4 nights (14-19 agoust) and could not have made a better choice .. It is just under an hour from Waisai, where you disembark with the ferry from Sorong. You Arrive at Kordiris by boat from the sea and you immediately notice how beautiful this place is: crystal clear water, white sand,palm trees, little dogs running on the beach, hammocks everywhere and especially the houses on the water (6 + 1 under construction) and the pier! Lusi, her family and all the boys are very kind and always smiling, they work hard every day and always do their best to satisfy everyone’s needs. The huts are clean, the mattress is always covered by a mosquito net and on arrival there are also large towels for the shower. Bathrooms and showers are in common and Indonesian style, so you can not be fussy! There is the possibility of even washing clothes in the washing machine, for a fee. The current in the common room is almost always available, in the individual huts instead comes on at around 7pm until midnight. The food is very good and Chang every day(breakfast + lunch + dinner are included / water, coffee and tea always available) and there is the possibility of organizing different excursions (in places around the Homestay and even more distant, for example we di the Trip to Pianyemo and it takes about 1.5 hours of boat) together with the guys who come with you always. Possibility of snorkeling and diving with equipment rental. YOU MUST DO IT BECAUSE IT’S A UNIQUE AND MAGICAL EXPERIENCE! I would recommend there’s not to be caught by laziness and too much relax and make at least 2/3 excursions (prices are quite low and you can share the trips with other holiday makers to divide the expenses / you always come back home before sunset and for the excursions that take the whole day there is always a packed lunch). Arm yourself with camera, underwater Action Cam, swimsuit, high protection cream, mask and fins and nothing else and you will live a fantastic experience! It was great to stay at Kordiris Homestay !!! Very good homestay, the place is wonderful, the bungalows are clean, the food is different every day and very good. The family is every time present to help you. Visiting Raja Ampat was a dream that came true. I loved so much. My stay at Kordiris was fantastic, I went for eight days and ended staying ten. I slept in one of the over water bongaloo and dived every day with Kornelious. Kordiris is beautiful and every morning I went swimming from my room and star gazed every night. Kornelious and his family were fantastic and warm. Kornelious is a wonderful dive guide, easy going and with a great sense of humor. I specially loved hanguing out with little Enzo and even saw a couscous one of the days. I wanted to go back badly this year but Coudn’t make it, however, I’m sure I’ll be back soon! Thank you for a wonderful time!!!! We stayed at Kodiris voor 6 days in February 2018. We started and ended our 3 weeks kayak tour there. It was fantastic. The place is very beautiful. We had the big over water bungalow witch is quit new. There is a little ocean breeze en it had no mosquitos! Deva is a very nice host. She does an excellent job there. She speaks very good English and put a lot of effort to make our stay pleasant. The have a good staff, they are very friendly and helpful. They have a own diving center. I did 10 dives with them. I enjoyed every minute of it. I never had any concern about safety. The food is very good and there was always enough. We did 5 home stays and they were all good. But Kordiris was definitely the best. We certainly want to go there again! I stayed only one night at kordiris because I wanted to get closer to Waisei to catch the ferry and catch a last dive after coming from Birie. Also I like the offered books and magazins and it looked like you can charge your things during day at the dining room. The toilets were clean. Sometimes a cuscus shows up (I had no luck). Anyway I liked the place beside of the diving and felt well there! My first place in Raja Ampat I came to was Kordiris. My original plan was to stay a few nights and then continue somewhere else. But no chance! I’ve stayed the entire time here. I loved the place. It’s very well organized, Dewa speaks excellent English and can help and organized almost everything. The pick-up worked out perfect. The diving was great, although you do need to be advanced or have good diving scills. The best dive spots, so as Blue magic, Sardines Reef, CapKri etc.are all close by. Tours were good, Pianeymo or Birds of paradise etc. The family is also very nice but it helps if you can speak a bit bahasa Indonesia, as they don’t understand English. So terimakasi to: Dewa, Cornelius, Isaak, Martinez, Anis and Lusi! We loved the location! We were lucky to get the biggest over water bungalow with our kids and every time we left the hut, we saw something amazing in the crystal clear water. The food was good, sometimes not enough when a lot of guests were there. The kitchen staff responded to wishes though and prepared eggs when we asked for it. Communication with Deva was excellent! She clearly knows what she is doing! Compared to other homestays we stayed in, the rest of the family/staff were not super welcoming, but friendly enough. At times with many guests, not everyone was able to dive/snorkel. Also the mangrove trip that I asked for 4 times did not happen because there was no capacity for that. Diving was ok, but not more. We are beginners/intermediate divers and did not feel safe at several occations. There was no briefing at all, the dive guides did not understand the common underwater signs (like 100 bar) and the equipment was not always in good shape. If you bring your own gear and are experienced, this is a beautiful spot. If you are not that experienced yet, I would recommend to stay somewhere else, as staying there and diving with neighboring homestays is not allowed by Kordiris. Snorkeling is nice, but beware, the current can be very strong from time to time. We spent 5 nights at Kordiris after we sent them a desperate Whattsapp message needing to be rescued from another Homestay/Dive Centre on Gam (Daroyen Village). We stayed in a Standard Room which is like a dormitory with dividers and suitable for solo travelers, people on a smaller budget or anyone that just wants to stay here! The Private Bungalows look lovely but we were just grateful to stay at Kordiris after our previous bad experience elsewhere. From the dining room and jetty we saw baby octopus, snowflake moray, cuttlefish, squid, blue spotted stingray as well as a couple of little black tip reef sharks, it truly is an amazing experience. Birds of Paradise can be heard and seen in the trees and we also found a Cuscus! The diving sites are excellent and the equipment is in pretty good condition (we were happy!). Do note that the guides are just guides and not PADI/SSI standard Dive Masters (no briefings, do your own buddy checks and safety stops etc) which isn’t a problem if you are a comfortable diver and is “the norm” for the area so I’m just saying. They are friendly and point out marine life, set up and clean your equipment afterwards and all of this is appreciated. The food is simple but delicious, they really know how to serve tasty Tempe and tofu along with rice, veg and fish. They will cater for vegetarians or people who don’t eat fish (which is their main source of protein) so just let them know and they will give you eggs or omelette. Sometimes we felt there could be a little more, especially for the men after a days’ diving and only having eaten a few fried banana or slices of cake for breakfast but this is merely an observation and it wouldn’t stop us recommending this place to anyone (we had egg sandwiches on a couple of occasions which was a good source of protein to start the day). This homestay has a lovely communal vibe and all meals/dives are done together which is perfect for anyone who wishes to be social but you can also be on your own if that is your choice. We have had this experience before when diving in Komodo, Sangalaki and Sipadan/Mabul and loved it so it was a pleasant surprise for us. Communication with Deva, the on-site manager who speaks excellent English is very good either via email or Whatsapp and it’s the small detail like this which sets your mind at ease (very important when staying on a remote island!). They also accept credit card which is worth knowing! Yes this is a traditional style homestay with simple design and features but if the cost of visiting Raja Ampat is an issue, if you don’t want to be on your own and if you want to snorkel, Freedive or Scuba Dive this magnificent area, Kordiris is an excellent option and one we would fully recommend. We stayed for a week at Kordiris. Must say it’s a slice of paradise. The hospitality, the location, the food, the views from the room, all just awesome. Also did 10 dives with Kordiris diving. Cornelius is a super relaxed and spot on dive guide. He knows the dive spots and underwater conditions really well and is also an amazing spotter. Big thumbs up to Kordiris and their whole team. Nos encanto poder bucear y disfrutar de el relax y la playa. Lo rodean tres islas pequeñas en las que el snorkel es muy bueno. La comida esta espectacular y la familia esta muy atento a todo. Se puede pagar con tarjeta por si al final como nos paso a nosotros decides hacer mas inmersiones de las previstas. El baño básico como todos los de la zona pero te da igual una vez estas en el paraíso. To the question why we cannot stay in an Overwater Bungalow we got answered – these Bungalows are reserved for Divers. I understand the fact that they keep these Bungalows for their ‘main customers’ – Divers – but if it’s not fully booked, would have been nice also Non-Divers could enjoy the stay in the Overwater Bungalows as the – Rooms in the Bungalow – are quite noisy and give not much privacy. Kordiris is the perfect homestay for rest and enjoy your time in Raja Ampat. The place is very beautiful and quiet. The family and Deva are nice and helpful. They arrange trips fits for you : snorkeling, dive, oneday trip to see view points. I highly recommand this homestay ! The best we’ve done in Raja Ampat ! and are they on kordiris homestay or not ? Enzo and Maria haven’t been based at Kordiris for some time now gerrard. You can contact them at Corepen Homestay. Hi, Maria’s name does not appear in comments on Corepen’s page after July 17. Has she started her own homestay yet? If yes, what’s its name and is it on Mansuar as planned? Still at Corepen as far as we know Virginie. My stay at Kordiris homestay was truly amazing! I extended my stay by an extra five days because i didnt want to leave..If my visa wasnt about to expire i would have never left! Lusi and Kornelis were so kind! I will miss them very much and WILL return in the future! Tried calling this no. :+6285244124338 to contact the homestay but it seems the no. is not active. Would it be possible to share their active no.? It’s probably just out of coverage area Ishtiaque. It was working yesterday. We stayed at Kordiris in end of November for 12 nights. The water bungalow on the jetty is nice, at night we like to walk to the end of the jetty to admire the stars. There are also florescent planktons just under the bungalow. The food is very nice, rice, vegetable and fish. Sometimes breakfast is a bit simple for example just doughnuts, breakfast should be improved. The owner and all the staff are very friendly and they are very responsive to our demand. The bird watching (bird of paradise) is very interesting if you have a binocular. From the dining area we saw cuscus on a tree, beautiful parrots and a group of dolphins playing. Kordiris has a very nice view. They have a wooden boat (sampan) for guests to explore around. Negative points are the water is salty (it’s the same in most of the places including expensive hotels so it’s not their fault), the bed is so used that we ‘sank’ into the bed. Simple bathroom but clean, don’t forget to bring your own shampoo and soap. We did diving with Maria and Enzo, they have moved out from Kordiris but they came to pick us up for the diving. We had a very good time diving with Maria and Enzo, the equipments are in good condition and they planed very well our diving trips. Also there are nice snorkelling spots when we swim out from Kordiris. Overall the stay in Kordiris was very pleasant. Enzo and Maria are now based at Corepen Homestay – you’ll find their contact details on Corepen’s page. thank you , but only email of the homestay , I am looking for email of Enzo az I loose it .. Absolutely fell in love with this place, originally staying for two nights but extended for a third and wish we had stayed here instead of going to Koranu Fyak. Suche a lovely, humble and welcoming family! Amazing food!! Lovely beach and a good snorkelling around the islands in front, saw cuttlefish, sharks, bumphead parrot fish, nudis, scorpion fish, Pipefish, stingrays, the list goes on. The diving was also very good, all the equipment was brand new that we used, and we always felt safe when diving with Kornelios(? ), he was very professional and knew the dive sites well. We regretted going to Koranu Fyak and diving there so much, utter shambles! If you are looking to dive or even just chill out make sure you stay here! 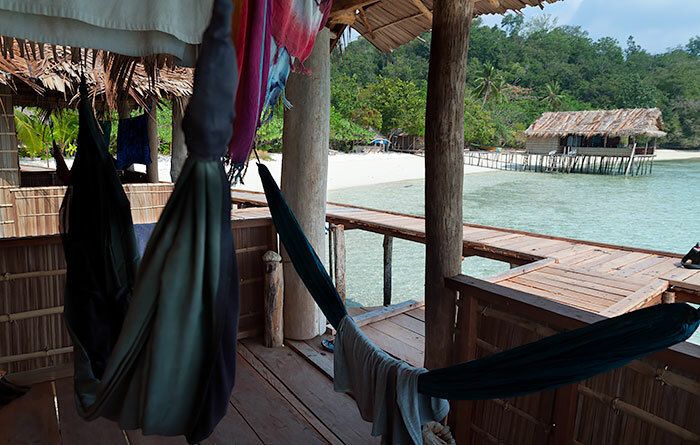 Lovely spacious bungalows over the water with hammocks. You can also see lots of wildlife without entering the water!, sharks, palm cockatoos, dolphins passing through, and we even saw a cuscus. We were lucky enough to have a close encounter with three speed whales that were passing through, coming less that 3meters from the boat on three way back from diving. When we return to Raja Ampat, we will be returning to Kordiris and this time for longer!! Thanks for your review. I’m looking at the homestays with scuba facilities and they all seem to be on south gam or kri. The other place I was looking at is Korany Fyak. Can you tell me why this place was so much better please? Also, is south Gam better than Kri in general? Kordiris is on a really stunning beach. I stayed there in 2014 and fell in love with it but decided to follow Maria to Corepen for my second stay when I learned she had moved. It’s possible to walk from K to C but only for a visit and certainly not with any luggage or on a daily basis. The 5 stars are for my 2014 stay. This time I just visited the homestay. It is much more developped than it used to be. They are now (April 2017) building new overwater bungalows in addition to the three existing ones. They have a large open restaurant and a diving center on stilts in the middle of the beach. The view is still beautiful. I just hope they will NOT build a restaurant on one of the islets, as they are planning. A small piece I paradise with idyllic location 6 small islands and your own Beach to relax on. The amount of sharks and fish you see from the jetty is astounding. A good local reef with lots of coral and fish, with a resident cuttle fish under number 1 hut. The homestay was alway kept immaculate with the beach cleaner daily. There is a easy walk into the Forest and you can see red birds of paradise, by there are so many birds flying around and past it is astounding place to be. Lovely family friendly and great cooks thanks do letting us stay. We stayed few day in this wonderful place, nice family, very good cooker, the food was different every days and it’s important! The best feeling I had was the feeling of being far from everywhere ! You don’t have the boats sounds all day long like in kri, no barking dogs like in kri… and each morning you wake up with so many bird song! Another great point is the master diver, Enzo, great guy highly skilled and so concerned about his divers ! We had the best dives We could imagine!! Thank you so much Enzo !!! We stayed 5 nights on this very nice place on a bungalow on the water. Enzo is a very interesting person and a very fun people ! The dive with his and Maria like divemasters is very safe and very good. The snorkelling is easy and we saw walk-shark just behind the bungalow. Th boat to Kri for next guest houses was correct.Thanks for all and see you next time ! first we had a trip& dive deal (join with other 4 guests who stayed in kordiris homestay )with the manager, maria, she asked us to wait at our homestay (also in Gam island,but with much better views&sands) till they got prepare for the trip. then we were just kept waiting and waiting till the manager came to our homestay (to picked up other guests go for a diving trip without us, which was such a shock ! )and then suddenly told us the trip plan was changed, if we still wanna go we need to go to the kordiris homestay and then discuss again. at that time we were confused and had no other choice then we went to kordiris, and finally got a bad news that the trip for us was canceled! at last we made a new deal with them to go for a one dive trip with more payment…..i dont think they are responsible for guests. in addition, the dive spot they took was just so so. there are so much more better spot for diving in raja ampat. kind of waste time&money. We stayed here in spring 2015 and am embarrassed that it took so long to give a review. It’s a great place to stay and dive with great staff, especially Maria and the instructor from Wakatobi(forgotten his name right now). Is it possible to provide you dive center if we don’t sleep at Kordiris? 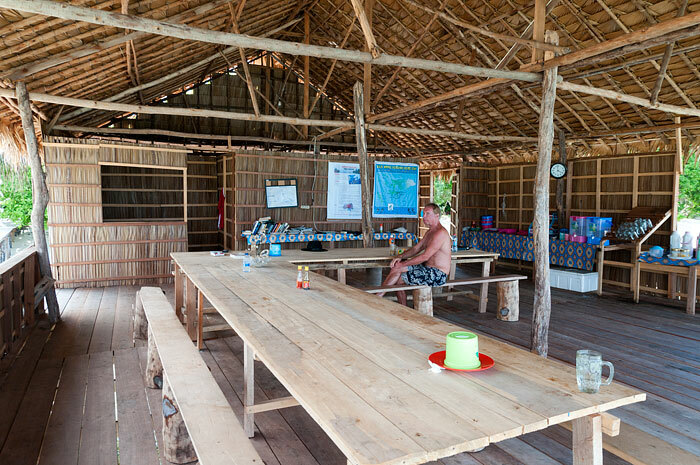 Yes – all homestay dive centres welcome outside guests as long as all their equipment is not in use by guests of their own. You should be fine. Maria: We are trying to decide where to stay on Gam; it seems you work at Corepen now and not Kordiris. We are not excited about communal toilet and showers; can you give us any help in deciding where to stay. I want to dive with you and am planning on coming with my wife in mid-May for ten days. I want to see the best of Raja Ampat. Hope you get this email. Have you tried using the advanced search? It will let you easily find all the homestays that have bungalows with ensuite toilets (as well as many other criteria that might be important to you). I’ve just spent 1 week diving with Maria in Corepen. Stayed there with my kids for 2 nights of total 6 because i want to feel the difference of several homestays. I believe Pak Cornelius is trying his best to give appropriate service to his guests, but some improvement could be made on foods and the flow of water in the bathroom. The generator is on during 6pm-9/10 pm and adequate phone signal for checking email or WA kinda stuffs during our stays. There are two good snorkeling sites on the front right and left of the dining bungalow ( it is about 150 mtr away). We even saw two squids and a small kalabia walking shark under it during the night after dinner. We stayed in over water bungalow which is good for the view but it makes you walk 100mtr to the bathroom . So small headlamps will help during the night. Maria did her best to provide what we needs during our 5 dives by giving us 2 dive guides for 3 of us and she managed to monitor our activities within her supervision . I am advanced and my kids open water but we didnot force to dive if the condition was not condusive. The depth was maintained very well and the location were well chosen. We were lucky enough to see 3 pilot whales from the distance. The rate is the best in the area and no need to worry about qualitiy ( i did other dives with other dive ctr which cost me more and got only one dive guide for 5 people) so make your own judgement. Just try to talk to Maria regarding your needs and budget and she will surely try her best to make it happen…. My main impression of Koridis home stay are below. In diving, I did total 11dives(9 day time dive, 2 night dives). So many beautiful corals and many fishes like aquarium! Awesome. Unfortunately visibility was not good overall. Only one dive was good visibility, which was 20-25m at sardin reef. The others were 5m to 12m. You should visit good visibility season which is Dec to Feb.
there are 3 divers(1 male dive master, 1 male open water and one female open water, who is Maria). You may be surprised that open water diver is your guide. But don’t worry. Male open water has a lot of experience. He has a confident. I did 11 dives. I paid 10 dives package, IDR3,900,000 and one dive cost IDR390,000 and manta point extra cost, IDR100,000. Usually they charge extra night dive fee, but I did many dives. So i could get discount. Passage point case is IDR600,000 (min 3 divers). This is transportation fee. Not for every dive. Maria told just one day before night about no diving in the tomorrow morning, because of staff going to church. For me, I wouldn’t dive from the beginning. So it’s ok. But another diver who had a plan tomorrow dive were disappointed. You had better check the schedule in advance. Otherwise you will lose the precious time. There were strong current at some points. You had better prepare a fook. I confirmed that Raja Ampat is advance diving area. You need a skill appropriate neutral buoyancy skill, equalizing skill and sink smoothly without diving rope. All diving style were boat dive. So full foot fin with naked foot is ok. But one day, we had a service interval at small island between 1st and 2nd dive. We needed walk a little to get in island on the hard coral with naked foot . Other diver cut on his backside of foot. I recommend to wear boots. There are Improvement points. Toilet and shower are not clean as you know through web site homepage photo. It’s ok to me. But unacceptable to ladies. There were two toilets and two shower rooms in the house. I think all of them share one water tank. water supplier capacity isn’t enough. If someone uses shower, in the other shower, water doesn’t get out. Needless to say, please prepare own shampoo and soap and towel and toilet paper! If the toilet and shower are cleaner, Koridis will be much comfortable. Food is simple. Lunch and dinner were ok. But breakfast was too small portion. I was surprised first breakfast. Because only the piece of bread! Another day breakfast was only noodles. The another day was only fried rice. I think breakfast cost is about IDR5,000. They should prepare a little better food for breakfast. Because food isn’t so expensive. I could ate local food at food stand in Sorong. cost was only IDR12,000-15,000. One night is IDR300,000-350,000 per person. As Another tourist comment, Diving business and accommodation business are separated. Diving service is good. I felt a lot Maria’s hospitality. But there is improvement points in accommodation service. One day, nuts on the table was eaten, plastic bag was scratched on the room floor. Maria said that the homestay dog did it and even if close the door, the dog still get in the room. If she already knows, I wanted to be told me in advance. Don’t put food in the table. Electrical generator works only evening to midnight. You can’t use electricity on day time. It’s good to prepare electrical power tank for charging. However when I woke up early morning at 5 am to watch the bird paradise, outside was still dark. But they started generator, so the light turned on. it made me pack easily. Good service. At the end, I show another big problem which was ferry between Sorong and Waisai. Operation was not smart. When I came back to Sorong on 5 May, my ferry was 2pm. But 2 hours delay. delay is ok. I predicted. But there was a ferry at 9 am which isn’t scheduled at ferry schedule! I don’t know why ferry company operated without notice. I thought there were many passengers. But how people knew there was 9am ferry which isn’t schedule? at ferry ticket counter. Please contact those person just one day before use. Anyway, I am sure I will come back Raja Ampat. There are still many sites which I haven’t dived yet. I hope you have a great experience. have a enjoy your trip! We stayed at Kordiris at the same time with Claire, whose detailed review is from the 1 May 2016, below, and we agree with many observations she made. We also want to underline, there are 2 businesses at Kordiris – Maria’s diving center and the accommodation owned by Kornelis and his family. Both are run in very different ways now. We would rate the work of Maria and her diving center as 5/5. The diving equipment never gave problems, diving was well planned, preventing doing it at a time with strong currents, dive guide Manu knew the dive spots well. His speciality is macro – nudibranches, ghost shrimps, etc. There was always a feeling of safety when diving with Maria and Manu. We would rate the homestay, except diving, with 3/5. It is located on a beautiful spot with a sandy beach and some spots of sand a few meters off shore as well. Snorkelling is easy from the shore, sometimes reef sharks and turtles could be seen 100 m away from the homestay and always plenty of coral fishes. We stayed at Kordiris in 2013 as well, and in 3 years many improvements in accommodation and shower-toilet area were made. They have running water now pumped from the well, available most part of the day. It normally ran out at 3-4 pm, and at 6-7 pm was pumped again. Bucket showers were available at all times. They have constructed 3 bungalows over the water (2 more in addition to the info on this website), where it is not that hot at night. Sadly, the place is no more that friendly as it was in 2013, except Maria, running the diving center. She was always ready to help and translate, if there were any questions to the homestay personnel, not speaking any English. New toilet paper was brought and water in the buckets at the bungalows to wash the feet was changed only on request. Fish for lunch and dinner was normally very dry, overcooked – not because it was not fresh, but that’s the way they cook now. In 2013 the mother of the homestay owner Kornelis was cooking very well, now other women are doing the job. In whole, there was a feeling, the homestay personnel (again, not Maria) is not wishing to communicate, even just be friendly, and make anything apart from the minimum, because the guests would come anyway – as the place is famous now. There was no discount given for the accommodation for 10 nights stay, contrary to 2013. One positive point was, that they still give additional food on request and at no cost. So, we received 2 times raw fish, once even fish filet, lime and coconuts to make ceviche. And there were always enough limes for the tea. Breakfast was minimal, pancakes or cake, but was enough for us this time. In 2013 we often asked for eggs, which they brought at no cost, hopefully this would be the case now as well. There are two separate businesses located at Kordiris – Maria’s Dive Centre and Kordiris Homestay itself. I will speak of them individually below. 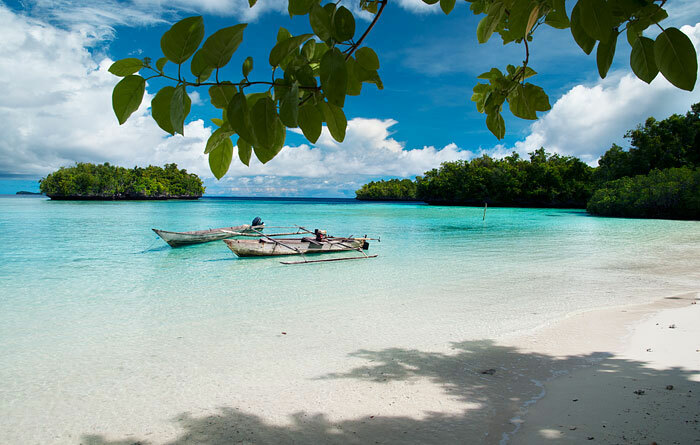 Regarding the homestay, the beach is beautiful – soft sand, and patches of coral for snorkelling. It’s in a truly stunning location. I was disappointed that the over water bungalow I was promised upon booking was double booked! Even worse, another one available was filled up by people who arrived after me. I came to an agreement with the owner who did apologise about this – I had read also that this has happened previously so be aware of it. It’s obviously a way to make more money (despite it apparently being a ‘mistake’). The rooms that aren’t over the water (or the one near those) have trees in front of them and seem to have more mosquitos and less of a breeze than the others. . Regarding the food, I really craved something healthy for breakfast. A couple of slices of plain cake (as delicious as it was) for breakfast with no other options doesn’t keep you full for long and I really didn’t want to be eating so much sugar. A couple of mornings I received 2 plain pancakes. Lunch was about 5-6 hours later so I was always absolutely starving by then. I was disappointed that I didn’t receive a single piece of fruit during my 5 night stay. I would have happily paid a bit more just to have fruit. It’s a bit sad that the dogs look so thin and hungry all the time (so much so they actually broke into some guest huts at night and scavenged closed snacks that were in bags!). Some of the dogs also coward away when I tried to pet them as if they may have been hurt in the past… A day after I had wondered about this, I saw the owner using a long white stick beating one of the dogs very hard – the dog was screeching loudly. I was horrified but was told it was ‘because the dog stole food from a guest’. I also heard other dogs screeching sometimes as they were beaten. It’s not the dog’s fault that some of the doors don’t have a proper locking system and they’re basically not fed enough. I later asked the owner to please not beat the dogs and he just smiled :-/ no water bowl visible either for dogs (perhaps there is one but I’d be surprised). You could see the rib cages protruding on most of them and it absolutely broke my heart. Kordiris has very poor mobile phone signal (I was using Telkomsel) – other guests said the same (just to be aware of this as the website says there is a good signal). Each time I tried to have a shower there was no water and when I asked the owners about it, there still was no water 20 mins later so I eventually gave up and waited for it to rain. Out of 3 loos, I only found toilet paper in one (and that often ran out and didn’t get replaced quickly). The highlight of my stay was when I was snorkelling (and the owner was there also), we stay a dugong – the owner got my attention and for that I am ever grateful as otherwise I would have missed the dugong as it quickly disappeared into the blue. I can’t praise Maria and her team highly enough. I was extremely impressed by the quality of the dive equipment offered by Maria. I had been somewhere previously where equipment often broke but that didn’t happen here. Maria and Manu are excellent at finding various creatures while diving that I would have otherwise surely missed. One leading and one behind a dive group also feels very safe. They really look out for the divers and check during the dives to ensure you’re okay. One of the most caring dive centres I’ve been to – even though it’s not listed on the PADI website and I was a bit nervous about the safety, safety here seems more of a priority that many PADI centres I’ve been to. They also are careful about the current conditions and discuss potential dive sites with divers the day before diving. Thank you for some wonderful diving!! We – a family of four and a couple – spent 11 days here in July, 2014. We loved this place! It is beautifully situated at a nice beach, good for kids. We (the family) stayed at the bungalow over water. We could see cuttlefish, juvenile batfish and small stingrays from the veranda, as well as different kinds of parrots, white bellied sea eagles, brahmani kites and bee-eaters. The place is good for birdwatchers. A must is the boat trip through Dore Dor, a stunning mangrove area. Red Bird-of-Paradise can be seen within a 15 minutes walk. Just ask. The snorkeling was excellent and varied, though it required a bit of searching and exploring. The currents could be pretty strong between the little rocks a bit off the shore, so if snorkeling with small children, ask beforehand where the currents are and take caution while snorkeling. The dinner area is close to the family. Of the places we visited this was the place were it was easiest to interact with the people who run the place. Maria and Enzo are very helpful. I stayed there for a week and the calm, relaxed atmosphere would lure me back there someday for sure. I had to wait in waisai harbor to be picked up and to check in to my room due to miscommunications but overal my stay had been lovely. The huts are made of leaves and woods and thats it. No lock on the door since it is a sliding door. Nobody lose anything though so thats a good thing. One thing that stand out the most is the beautiful sandy beach this homestay is located. Most other homestays there dont have sandy beach at all! There’s a garden between the huts and the beach so you can relax in the shades. Food was ok. After reading the reviews i prepared huge bag of foods to survive a week there but turned out the foods served was better than i expected. The usual menu for breakfast was fried rice, for lunch & dinner rice with fish (sometimes chicken) + vegetables + fried noodles or glass noodles (bihun). The diving with Maria and Manu was interesting, surely not for the inexperienced. Had done 14 logs during 5 days of diving, too bad the visibility was murky and the underwater condition was not as clear as I expected. You have to know what you like, what you want & what you need, then communicate those clearly and repeatedly to the dive guide(s). Be proactive and asked about the dive sites you’ll visit. I’m really thankful for Maria’s help to organize whatever activites you want to do while you are in Kordiris, wether its island hopping, snorkeling or diving. I’m also really thankful to the owner of the homestay, Kornelius, since he agreed to let me use his brand new boat and act as my dive guide to 4 dive sites on my last day diving there. Saw 5 mantas on manta sandy spot which was truly enjoyable. When I hear the name Kordiris I get association of Maria – lovely and very frendly and helpful Indonesian girl who is responsible for diving thereI loved to dive with her and Manu. It was very relaxing. Manu was able to find many different small creatures and Maria always took care of the divers below and above the water. But I wouldn’t recommend R4 to newly certified divers as there can be quite strong currents. Kordiris homestay could be cleaner incl. bungalows and toilets. They could provide fruit for breakfast/lunch/dinner like they do at other homestays. But you can give money to somebody in kitchen and ask them to bring the fruit from Waisi. If you dive, Maria will always take care that there is some fruit & cookies to eat during the surface interval. Overall I liked the place because of Maria, Manu, great diving and turists who were at that time there. We stayed for 8 nights and had really relaxing and enjoyable time. Maria made us feel welcome and was always efficient and friendly. We snorkelled most days and were included with the dive trips. The food was great. We took our own cereal and milk powder for breakfast which was a good idea. We would not hesitate coming back again to Kordiris. Absolutely idyllic. Me, my wife and my 3 y.o. son stayed there for 5 night (30 Dec – 4 Jan 16). 1. Toilet could be better and cleaner. 2. Breakfast menu could be better. 1. Be careful of the trees in front of the room. They are beautiful with butterfly and provide shades for you, but I found several caterpillar that may sting. 2. Bring your own snacks or fruits. Nothing wrong with the food, it was sufficient but you get nothing in between the meal time. 3. Don’t be afraid to ask and clarify your plan for the day. 4. Estimate your budget, bring Rupiah in cash and don’t be so stingy. Lots of people say Raja Ampat is expensive. Yes, it is expensive compare to other place in Indonesia because it’s remote location, but it is not too expensive or may be cheaper compare to other tourist destinations in developed countries. 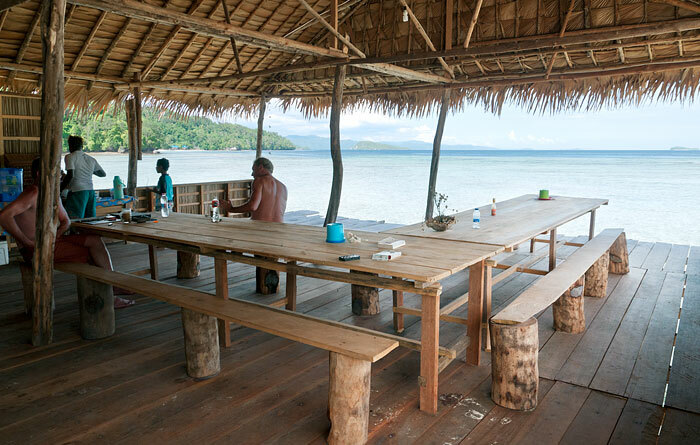 For example: 450 USD to bring 6 persons to Pianemo with lunch and snorkelling is reasonable. Tourists from developed countries should not be complaining. I thinks all prices are reasonable and you should be aware or informed prior to your arrival and do some benchmarking with other places. I was lucky enough to get an on-the-water bungalow and could therefore enjoy the calm and the view. Warm common area with water, coffee and tea available throughout the day. They accommodated my vegan diet with tempeh, tofu and fruits, which made the others jealous because they usually don’t serve fruits. Every evening Enzo would come to see us after dinner to discuss the activities of the next day (diving but also bird watching, boat tour in the mangroves, etc. Mainly the fact that they literally let their dogs starve, which made me very sad and ruined my stay. not taking care of the animals is a standard in Indonesia, but letting the dogs that are supposed to “protect you” starve is just pure cruelty. For most of the dives I did there it would not have been necessary to go that deep for that long, the shallows were much nicer. Bring your own equipment, I ended up having a short wet suit instead of a long one and short fins that were useless in currents. Breakfast was very poor, I just got some fruits and the other some cakes, we were hungry 1 hour later! Expensive diving: 450’000 per dive + 150’000 for the equipment, which was not top quality. Positives: Lovely location, awesome over water bungalow, unusual green phytoplankton visible at night, tasty fresh fish every day, free tea and coffee, good snorkelling, stunning sunrise. A good all round place. Negatives: Like everywhere else in Raja Ampat transport is overpriced. We were made to wait 3 hours before we set off from Waisai because the family were doing their shopping. However they still charged us 400,000 for it. The diving was also..interesting. I am newly qualified and my husband is a rescue diver. My experience ended up being just one dive because there was no communication, I was terrified going down in strong currents especially after being told that I was not allowed to check my equipment on the boat as there was no time, I just had to go for it. This was my 5th dive ever, we quickly went down to over 20m (I was only qualified to 13m!! ), nobody checked how much air I had left, and when I made it clear I was on only 50 bar we still didn’t go up and by the time I was out of the water I only had 20 bar remaining…a bit scary for a complete novice. My husband had a slightly better experience doing 4 dives, but again suffered from a complete lack of communication. He was not warned of strong currents where he literally had to hold on to rocks and coral for dear life. There was literally no pre-dive planning, no discussions about what was going to happen, how deep we were going etc. From speaking to other travellers it seems that this is the way most diving is in Raja Ampat. Unless you have at least 40 dives to your name don’t even consider it. Even then it’s highly dangerous due to a complete lack of organisation. The other thing to consider at Kordiris is the cost of diving. The information above is not true, it actually costs 600,000 for one dive (if you’re doing one per day) at the end of the stay they hit you with a 150,000 daily equipment charge plus the 450,000 guide fee per dive. This was not made clear anywhere at the homestay and again not communicated to us in any way until we got handed our final bill. Just be careful of these”more successful” larger homestays. We didn’t even really meet the family who run this place and for us the whole affair felt more like a badly managed hotel experience. Literally a world away in terms of service compared to Yenros homestay where we went afterwards and cannot speak of highly enough. If you are looking for a genuine Papuan homely experience this is not it at all, you are better off trying one of the lesser known places. However if you want to do lots of diving and you are extremely confident, then this place could work for you. Just ask a lot of questions and be upfront in terms of the cost of everything. Thanks for the update and your detailed feedback regarding your diving experience. It’s much appreciated: In addition to helping alert other visitors, the information you’ve provided will be presented to the Homestay Association and Kordiris and will definitely help efforts to improve any sub-standard services. Our apologies for the previously outdated dive price information: We’re not based in Raja Ampat and only get to visit a few times a year, so we rely on homestays to communicate price changes in the meantime. Unfortunately, that doesn’t always happen. We also agree with your comment regarding considering less popular homestays – they have a lot to offer. It’s such a shame that the “lonely planet effect” results in everyone wanting to stay at the same few places! 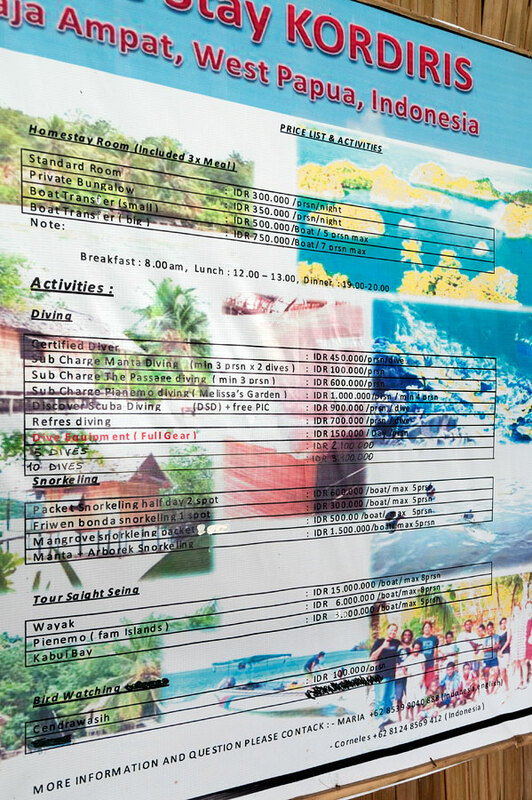 You should read the price of the diving (the price list is in the restaurant) or ask for them before complaining and you forget to say that you didnt pay the equipment rental and the snorkeling. You only wanted a discount on the diving!!! Kordis was amazing. The view was fantastic, nothing better then waking up to paradise with a cup of coffee sitting in your hammock… Amazing. We had an over the water bungalow which was awesome-defintely recommend this as you at least get a breeze at night. It gets quite hot and sweaty! It’s a very basic rustic bungalow- and the bathrooms are very traditional. Bring your own soap/hand sanitizer! We loved the rustic feel and were pretty comfortable with all the accommodation. Generator is on for 2-3 hours every night and shuts off at 9:30ish, you have lights and a plug in converter plug in your room! Bring deet (98%) there are few mosquitoes but to keep the flies and ants away the deet was well worth it! Meals were fantastic besides the occasional hard boiled egg (1each) for supper and next to nothing for breakfast (small buns, cake loaf and bread-no spreads or anything-very dissapointing) other than that the meals were awesome traditional Balinese meals usually fish and tofu rice and veggies. There is always hot and cold water avaliable as well as coffee and tea which is really nice! Overall, we had an awesome time! We just got off a liveaboard so we didn’t do any diving but Enzo seemed to do very well! They only take cash as payment for the home stay but any diving you do is handled by Enzo and he takes paypal! I would definetly recommend and we will definetly stay here again!! We planned to stay for 7 nights but stayed longer! Our over the water bungalow was simple but comfy and the hammocks outside were perfect for relaxing with a book between dives. We were slightly worried it would be hot at night but this was not the case, in fact we often used our sheets to keep warm! The setting is ideal, lovely beach that is often cleaned with great views. 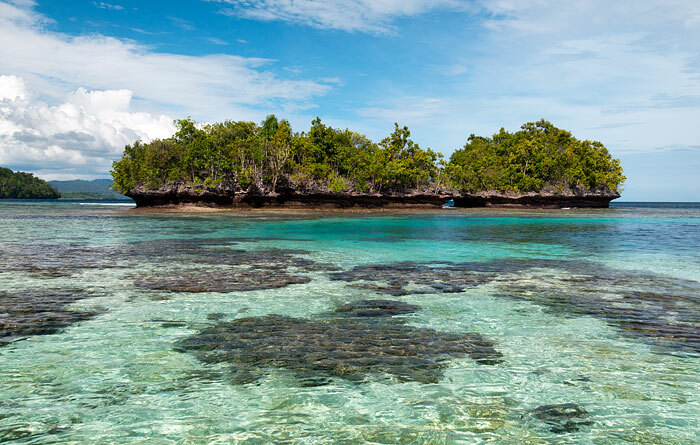 The nearby reef is good for snorkelling but be wary when there is a falling tide as the currents near the island in front of the honestly are strong. We did 12 dives and they were spectacular! Enzo is a very likeable guy who will try his up most to ensure you go to the sites that interest you. If you don’t like strong currents then he will take you to those sites which can have strong currents at the right tidal times to avoid the current. We dived at Cape Kri once for strong currents and they are very strong, holding on to a rock or using a hook to stay in place.. Manu, the local guide has excellent eyes and so if you like macro his is very good at finding nudis and pygmy sea horses.. The homestay had beers (cold) and will purchase for you soft drinks or other things you require when they visit Waisai. We joined up with some others and did a tour to Painemo (spl?) and the waves made for a very wet crossing but worth it as the view is superb. The crossing took around 1.5hrs. The food was generally good, mostly fish but occasionally chicken, eggs and omelette. Breakfast was the only let down as it was sometimes just 2 small cakes. There was occasionally fruit available but not often. I’m just back from my third trip to the Raja Ampat, and from my third, long stay in Kordiris – I did stay there 25 days, and once more everything was perfect. The beach and location are really as beautiful as possible, the best I saw in the islands, the staff always nice and helpful, and Maria, the manager of the place and the nicest person you can ever meet, was priceless complying with any request, taking care of everything and organizing any thing, from boat trips to bird-of-paradise-watching just a few minutes’ walk from the homestay. The facilities are still simple, but clean and well tended, and the new ones (new restaurant / common area, western toilets and showers, and especially the new wonderful over water bungalows) are really a great improvement. As usual the diving was awesome, and the diving center is perfectly organized and managed by Enzo the divemaster, who, with his continuous care and deep knowledge, made every single dive unforgettable. So, I just have to thank everybody for a perfect holiday, and I can confirm this is definitely my favorite spot In RA, absolutely worth coming back here again and again. My husband, my san and myself had a great time at Kordiris. We planned three days and stayed five. There you really feel like in the lost paradise. Nature under water and above water is unbeatable. The place just for a few of us. The place is very well run, the installations are simple but in perfect conditions, clean and neat. The diving equipment in good conditions. The diving masters, all very reliable people. All in all the place is highly recommended. My friend and I had a fabulous stay in Kordiris. The place was great, the food was yummy and the caretaker (Enzo) was super helpful. We spent our time snorkeling, jungle trekking, bird watching and beach walking. We met super interesting and friendly crowds over there which made our stay even better. I am writing this review to say that we are returning to Kordiris when we come and visit Raja Ampat next time. We stayed in Kordiris in January. The place is beautiful, the beach is amazing and the view is incredible. Maria is a very nice woman and she tries to do her best. that are the only positiv point in Kordiris. The bungalow are very poor and not really confortable. But that’s okay when you wake up and see the incredible panorama. The bathrooms are dirty, stinky and not functional. The water for the shower is from a dirty spring just few meters away from the home stay. We saw only on the last day from very the water was coming and when we saw it we were just happy to leave soon. We stayed there one week, they never cleaned the toilet and never change the toilet bin which was full of used toilet paper. The food was poor. Some days we didn’t had any breakfast because the didn’t want to stand up to cook something. luckily we had some food with us. the table were never cleaned and the dishes only washed hours after lunch. flies were everywhere! The dive master was very pissed off of everything. his knowledge about fishes and coral was very poor. We lost him more then once during our dives because he swam so fast we couldn’t follow and he never look after us. if you want to dive there you have to be an expert because it can be very dangerous. after a week there we were very happy to leave but we were very disappointed to spend so much money for this poor services. And it is sad to see they receive financial support from the government and the use it to buy a new TV for them and not invest for the home stay. We travelled a long time all-around the world and for sure this was the worst place we stayed. My mother and I stayed here in November and of all the 5 Homestays we visited this was our least favourite. We had booked the over water bungalow, only to arrive and be told it had been given to someone else. This was after many emails and arranging our schedule to stay in this particular room. Not a big deal, we were on a holiday! This was our first Homestay so had nothing to compare and thought this was just the way it is in Raja – this would not be the case. The room we were in was just fine, clean and comfortable. We were moved into the bungalow we had reserved for the last 2 nights of our stay. The food was very poor while we were here, so many flies, again we thought this was the norm, but after visiting other places we realized they could have done a better job. What was most disappointing was what Jonathan had tried to charge us to to go snorkelling, or to see the Manta Rays, at least twice the price of other places!! I had checked with them to be sure they were quoting me the right price. They obviously cater to divers and not to snorkelers. Fortunately the snorkelling to the left of the homestay is fabulous!! I stayed at Kordiris homestay on 4 separate occasions. I completed a couple of kayaking trips throughout the islands. I knew what to expect with Kordiris. My room was quite, the food was good and the surroundings were beautiful. Thank you Maria and Claude! It was great meeting you two. There are multiple bungalow types to suit most groups. I was traveling alone and they offer an affordable room with privacy. The beach faces east making witnessing the sunrise spectacular. You can pair the early morning with a birds of paradise tour. There is no price for the tour, they suggest tipping the guide. 30.000 – 40.000 rupiah seemed generous to him ($2.50-$3.00 US). A nice reef is situated about 100 meters from the beach. At night, black tip reef sharks came near the beach on a couple of occasions. They could be spotted from the common area. I am not a diver, but was still satisfied with what the homestay had to offer. The majority of the guests were divers and they seemed very happy with their dives. Prices vary depending on the type of dive. They also offer 5 & 10 dive packages allowing you so save a little money. I always had decent internet connection here. I recommend this homestay to everyone. Is there any other way to pay besides cash? Or do I really have to carry 10Mio with me? You could try contacting Kordiris and asking if you could pay by bank transfer, but apart from that there is indeed no other way to pay at Kordiris (and most other homestays) except with cash. Hi we are staying here in March and were wanting to know how much the diving costs? Does anyone know, Including everything but a mask? Maybe 15 dives each? And the cost of a trip to other places, fuels costs are a little lower at the moment I see, is that right? Any ideas, guesses or info would be great! Hi Justin and Sascha – the quickest way to find that out would be to contact Kordiris and ask! Their contact details can be found above. You’re welcome and no problem to put up here too. Maria’s the best person to contact usually. Good luck! Already in November we did a reservation of 10 days beginning January 12th and got a confirmation by Enzo. First of January we got the information about cancellation of all the bookings for the divers in January due to big problems with their diving shop, compressor and tanks. We answered that we will start on an other place, but after 19th of January we would like to stay at their place, if diving is again available at that time. Enzo answered, he will let us know, but we never got any message again. On 12th of January – after arriving in Sorong – we got some informations from the tourist office at Meridien Hotel; asking about the situation of Kordiris and after a call we got the information, that diving is operating and that the homestay is fully booked by divers from Hongkong. So there seems to be a communication problem – however we were very disappointed. Anybody has dived with Kordiris dive center recently ..?How it was ?Do they have dive master there ?Equipments ?Compressor ? Last December 2014 I spent 9 great unforgettable days at Kordiris homestay. the place is really beautiful and relaxing, and the people are very nice, kind and always helpful. I went snokeling everyday just in front of the homestay, or we went by boat to many different islands and diving sites; the food was also very good. I can recommend the place to everybody. hi! Which is the distance from Gam to Kri Island? Is it possible to get around Kri Island just walking? How big could be kri? 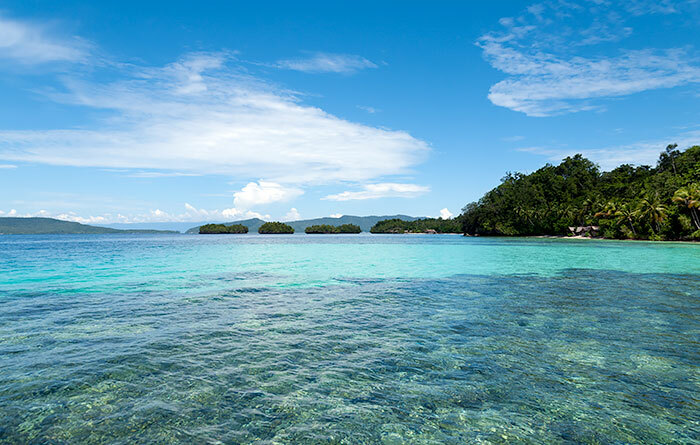 We really want to stay with At Kordiris Homestay, but also we’d like to spend a lot of time snorkelling around Kri. Thank you in advance. From Kordiris to Kri is about 6 kilometres. Kri is about 3 kilometres long by just under a kilometre wide at its widest. At low tide it’s possible to walk the entire length of the northern side of the island. See our maps page for more detail. I’m trying to get in touch with Kordiris homestay for almost two weeks. I have tried all (calling, email, SMS) but no luck. Could anyone help me to get in touch and book accommodation in a private bungalow, coming to Waisai on the 30th of January? You’re not the only one to ask about this so I just called Maria at the number given above and she answered immediately. She said she has responded to several SMS from you and has no idea why you didn’t receive them. Suggest you double check Maria’s number above and give her a call. Thank you very much for your quick response. Unfortunately I haven’t received no SMS from Maria. I really don’t know what could be wrong.. In last two hours I have tried several times to get in touch with Maria by phone, still no go. Would it be possible to ask Maria if there’s a vacancy for two at Kordiris from 30.1.15 for 3-4 nights? Doug, thank you again for help and keep up a good work with this website! Have you new Information about the contact, or you are still there. The contacts for Kordiris are shown when you click the blue Contact Homestay! button above. They are correct. Where can i find the prices for diving and do they provide full gear? Also, is the over water bungalow same price than the others? Yes, all Kordiris rooms are the same price. You’ll need to contact them for dive prices and to find out exactly what gear they have. In early December 2014, we stayed 5d / 4n at Kordiris homestay. It was the third place of stay of our trip that Ranny, (excellent) local guide, booked it for us. While accommodating twenty guests, we were only 6 so we happily avoided the mood camp divers that can be cumbersome when you do not dive. Being in a small group, the atmosphere was very relaxed ; friendly benevolence of Maria and the advices (in French) of Jonathan (master diver) made the stay very pleasant; improvised snorkeling trips, watching birds of paradise (only two steps away ), going to the party of the new Church of Yenbuba on Mansuar, eating tasty meals, late night discussions are parts of the magic of this unreal beach. Je vous embrasse, à bientôt peut être ! I have been trying to book a trip with you guys and I have had no reply, Could you please help me out and contact me on +614 49171530 or jtgibson1979@hotmail.com. or give me some other contact info? I have tried all the contact info and will keep trying, they will get back to us soon enough, I just hope we get the opportunity to stay at their amazing homestay! Your website is truly a wonderful resource and I thank you for setting it up! Great to hear it’s helpful and we really hope you get a response soon. Contacting homestays can certainly be a problem, but we’re working on a solution. We hope to have it up and running in a couple of months. It should make arranging a stay a whole lot easier for both homestays and guests! on his recommendation we came to the best organized homestay. during october ’14, and had best time we can imagine. parrots and even cuscus during day. Enzo and Maria will solved any of our demands. Delicious and plentiful food, fish, chicken, veggies, rice, noodles, fruits. You can use local kitchen so we prepared sushi and Tom Yum for all. We brought enough beers, wasabi and bigest Nutella. Excellent diving and daily trips organization. Best on Raja. with local friendly family of Kornelius & Lucy. The best places we have ever stayed. Next time we’ll be come back, for sure. We arrived july 7 and spent a great week at Kordiris with it´s friendly staff. We enjoyed snorkeling the great reef outside the beautiful beach, saw birds of paradise in the forest close to the home stay, and did the most amazing excursions with the competent staff that took an effort in showing us the marvels of Raja Ampat. Like all the home stays we visited the food is good but basically the same for lunch and dinner; fish, rice and veggies. For breakfast mostly a sweet cake with coffee/tea, so it might be good to bring some extra energy. During our week we saw turtles, sea snakes, reef sharks and even a dugong (plus so much more!). Do make the excursion to the Passage – there´s nothing like it. We highly recommend a stay at Kordiris! I need a place with excellent snorkling in front of the homestay…is there a big difference with Yenkoranu considering the snorkling ?? IDR350,000 per person per night, same as the others as far as we know Zaza. At first I was supposed to stay 3 days and then hop to another island but it was so quiet and beautiful and cool that I stayed 10 days. Maria and Enzo are the perfect hosts. The dives were fantastic and I see no reason at all for me not to go back there as soon as possible. Thank you STAYRAJAAMPAT for allowing me to find this piece of paradise on Earth. After so much searching on internet, comparing with a neverending list…we chose Kordiris…and I have to say that was bullseye. This place is amazing, the snorkeling, the food….and Maria is a delightfull person…super helpful and is always happy. We also would like to mention John Terminal from Sorong, he was literally an angel, he `rescued ´us from nowhere in the harbour, when we were stuck because there was no information, no one, no ferry no nothing…so if you arrive during the weekends be sure to know what time your conection is! We stayed at Kordiris at the end of this April 2014, for 5 nights. We’re 4 guys from Saudi Arabia.. our stay was really lovely and comfortable especially with having Maria around to communicate in English and order what you wish. We were all Non-divers but we really enjoyed snorkeling so much, especially at the passage point. We were planning to go to Wayag but changed our minds since the cost is really high and the weather is unstable. We decided to go to Piannemo and was a prefect decision. One note here: The locals in Kordiris gave us really a VERY high price to take us to Pianemo (around 11 Millions!!) so Maria called another home stay boat(or hotel!) and we went for 6 millions with much better boat even! If you want Ice or coke or anything(I wouldn’t say beer since it’s prohibited in my religion, Islam lol :p), just ask Maria they can buy for you. ( Ice stayed with us for like 1 day and a half or 2 before melting completely). Thanks again for this beautiful website. We spent a week in Kordiris after spending 10 days on Kri Island. Maria is a perfect host, she is friendly, helpful and very professional. You can ask her anything and she will organize it for you. We did snorkeling trips (near, so not too expensive) and a walk in the jungle early morning to see the paradise birds. The place is amazing and the food is really good. We had a very nice stay ! Stayed here 3 days and had a good stay, although we felt that the prriority here is diving. We only snorkel and felt that you could better stay on Kri (where we were before to do this). Maria is not very keen on organizing snorkeling trips for you (only possible to go to manta point when divers go and other snorkeltrips in the afternoon only because in the morning the boat takes the divers. It’s also a bit more expensive than other homestays. Otherwise, the beach is beautiful, the water and view are amazing. You can walk into the jungle from here as well and there are lots of birds. The rooms are clean and you have private bungalows where you have your own verandah, though not a private bathroom. The communal bathroom is very clean though. The food was very good as wel l, varie df and vegetarian options. All in all, beatiful setting but mainly focused on diving. My wife and I stayed here for a few days in February 2014 and had an incredible time. Maria, Kordiris, and his family and friends are all great. The diving was amazing, however be sure you are VERY experienced as there is no real divemaster — more of a dive coordinator, but once you are underwater you are on your own. The journey there is long but worth it as once you set foot on their little Island, you will be in Paradise! The snorkeling right off the beach is fantastic. So much life right off the shore. As for meals, fish, fish, rice, and more delicious fish. One of the best places we have ever stayed. Left super relaxed. Take in the sounds of the jungle and birds of paradise while there. Enjoy!!! always have a suggestion how you can improve your stay and enjoy it even more. consider myself very lucky that I landed there by chance. Four of us (all New Zealanders) stayed here for four nights. Maria is the shining star of this place – she organises the diving and snorkelling trips (using her gear and boat) and acts as facilitator of everything you need done – including helping you organise your next home stay to move to. Without Maria, you would struggle here (she speaks English). The food was tasty and the price was good. Compared with some of the horror stories we heard from people staying at other home stays, this place is good value and feeds you well. The house reef was not rich in coral and was subject to currents. When there are more than 6 guests, the home stay desperately needs another toilet and mandi. It would have been nice if the toilet and mandi were cleaner. The birdlife was great, including red bird of paradise 15 minutes easy walk from the home stay (you can do this yourself). Ask Maria to arrange a boat trip through the Mangroves behind the island Kordiris sits on. If you are a homestay person and a social extrovert, this might be your place. For us it was a bit cramped in the building with four rooms, also quite shakey when someone is walking. We stayed a second time. The building with 3 rooms where we slept later was better for us, it was more stable and the rooms a little bigger. The restaurant is not that close, so you don`t have to listen to everybody`s conversation when you`re in your room. We got one of the big mattresses that time which made a difference too as the thin foam mattresses are a bit uncomfortable. The bungalows would be the best choice and they are going to build more – which is great. The mosquito nets are good and without holes. Hygiene can improve, at least the bins should be emptied more often. Toilet needs more looking after when a couple of guests are sick. But then, it`s a homestay and its cheaper than most of the lot. Food was ok for us. I was staying in Kordiris in November 2013 for 10 days. It was really wonderful! The hostipality is superb! The food is really good and diving with Cornelis is really cool! Special thanks to Maria – you made my holiday so great. I always think back how nice it was talking in the restaurant while it was raining the whole day. Incredible! So all thumbs up for Kordiris! As Marcello (previous comment) I planed to stay like 4-5 nights in Kordiris and ended up staying 12 nights, I would have stay longer (hello lucky Ulie!) but I had to leave as my return flight to europe was waiting for me…I will write a longer comment later about this place but I am taking the opportunity here to say thank you to Mama, Nelce (I hope I did not mispelled your name) and their familly for one memorable stay in paradise. And moreover to say thank you to Maria for all you help and for the big laughs we had together. Maria, you made my stay there a memorable moment full of sweet memories. For all the jalan-jalan ;) and other amazing trips around THANK YOU! I’ve been @ Kordiris homestay for almost 2 weeks in Late August. My first intention was to stay just 2/3 nights and then move to other places… but after 10 days I was still there and didn’t want to move on. It is definitely the best place I visited in my last trip. Maria, the manager of the place, is the nicest person you can happen to meet, speaks a good english and is a priceless help for any relation with local people. Of course the diving is outstanding in the Raja Ampat. Enzo, the Italian divemaster, here runs a small and very well organized diving center with well mantained gear, he personally cares for the divers and with his constant attention and unselfish advices really can make the difference for divers of any level of experience. Of course there is good snorkeling right from the beach, and anyway the place is good even for non- divers/snorkelers, just to relax and spend a few days out of the busy world. OK, by now you all know I love this place and the people I met there. I just hope to have the chance to get back there, and that this place won’t change too much! 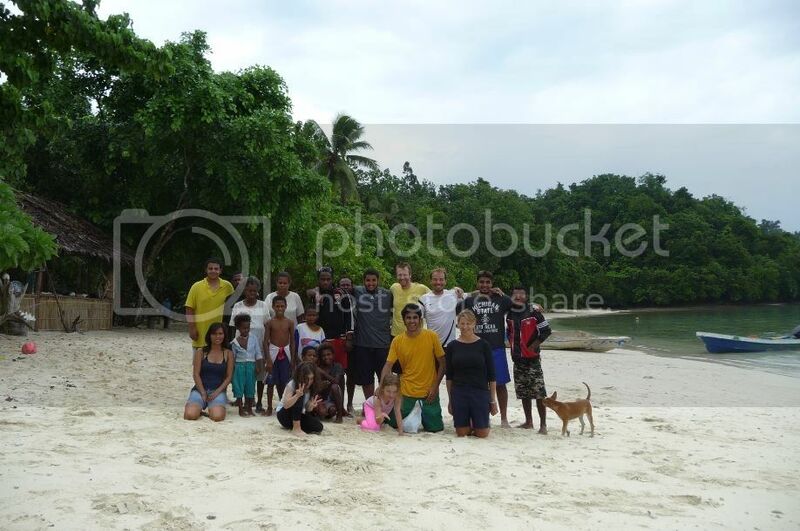 Great review Marcello – thank for taking the time :) Thanks too for the link to your Kordiris Homestay photobucket album. Excellent photos! sauces, or baked in leaves, sometimes squid. Some vegetables and fruits came directly from their garden (like eggplant or lime). At the time we stayed they had 5 rooms and were about to finish another few. The room we had was pretty comfortable, with a new mattress and a mosquito net. good dive site just 100 m away – Maya Dream, snorkelling was also interesting there. Max (or Mike’s) Point is another 500 m or so away. trips were difficult to organize on some days because of lack of petrol in the villages (it happens in Raja Ampat) or busy guides. Maria (the manager of Kordiris) has diving equipment and a compressor. Maria manages Kordiris very well, she is a nice, responsive person, speaks good English. The friendly owner, Kornelius, is on 3 pictures from the boat. The 2nd last photo is not from Kordiris, but from the neighbouring beach. Received by email from Thomas van Luijtelaar. Thanks Thomas for helping out the folks at Kordiris by letting us know of them and providing the original information. 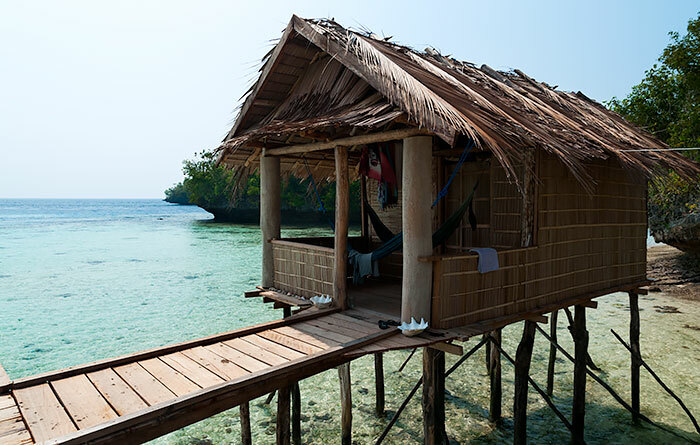 This Raja Ampat ‘Kordiris’ homestay is truly amazing. The family is very hospitable and the setting of this place is wonderful. 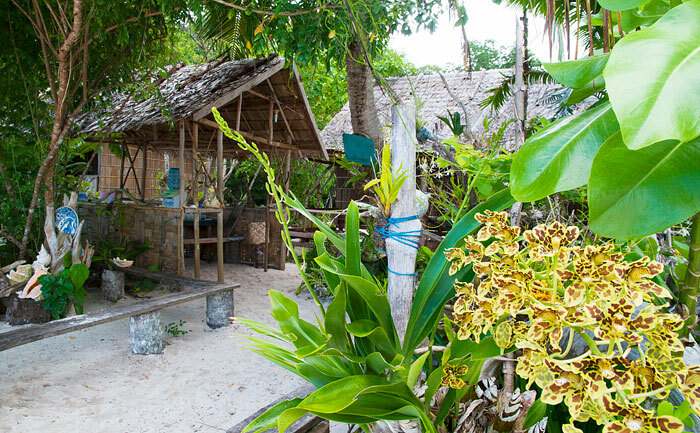 This hidden gem has an original Papua style bungalow sleeping up to 6 people (two more being built at the moment), with klamboe (mosquito nets), good mattresses and a nice seabreeze. Toilet and shower is traditional (mandi): a bucket with water from the nearby well. The whole place is very stylish with great ocean decorations. The place is perfect to have a lazy day in one of the hammocks under the palm trees on the beach or go on a tour. The family can arrange different tours like a walk-snorkel combination in their own bay or a paradise bird watching trip early morning our late afternoon. A longer and highly recommendable tour is the one to Kabui which includes snorkeling in two great spots and a climbing to a Wayag-like panorama (the one of the brochures). All are a great day out. Just ask for it, Maria and Cornelis will explain. Their private beach by the way is excellent for swimming and snorkeling. Maria speaks good English and is operating a small dive business too. In case you have very limited time and want to do as many dives as possible in a few days, I would recommend a dive resort. When you are looking for one or two dives a day and don’t mind not having the fanciest equipment and the perfect size, this is perfect. Everything worked well. Dives cost 450k rupiah (cheapest in Raja Ampat!) and include all equipment. Ask for a good guide. Personally I wasn’t very enthusiastic about Mathias. Paulus may be a better choice. In Raja Ampat it is one of the best value you can get for your rupiahs. In the unlucky event the place is full, consider the place of their uncle (Thomas – see album) on the next beach. We checked it out and it looked charming too with comparable facilities. This little paradise deserves more visitors. You can be one of them, you will love it!